Managing business expenses used to mean two things: spreadsheets and paper receipts. Tedious and prone to error, smart companies are replacing this manual method with more effective, paperless solutions. Paychex expense report software can save your company time and money by automating expense management. Our employee expense management software can help you control and reduce discretionary employee spending, while giving you the visibility and communication tools necessary to understand and manage company policies and spending behavior. Get the access and analytics you need to better manage your travel spending while uncovering new opportunities for savings. Import expense data directly into your general ledger and accounting software to save time on data entry and improve accuracy. Take a big step toward eliminating cumbersome spreadsheets and paper receipts by automating expense reporting online. Our expense management software works easily with your general ledger and accounting software. Compared to entering expense data by hand into a spreadsheet, we can help shave hours off your company’s reimbursement process. 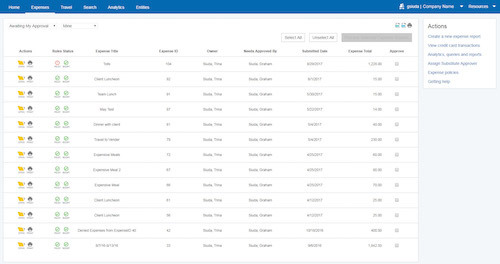 Managers can review expense reports without any paperwork and approve requests with a single click. Most expenses can even be pre-approved based on the rules you define in the system, and violations of your expense policy are clearly highlighted for easy adjustment or removal. Eliminate excessive spending by monitoring and communicating expense activities in real time. Business travelers will know immediately when their expense report does not comply, because the expense limits and policies are built right into the system. Gain visibility into your company’s spending with detailed analytics, so you can uncover opportunities to reduce expenses and negotiate better rates from suppliers. Fill open positions faster — while making the hiring process easier for your applicants — with Paychex Flex Hiring.